On January 15, 2009, commercial airline pilot Captain Chesley “Sully” Sullenberger safely landed US Airways Flight 1549 in the middle of the Hudson River when the plane struck a flock of geese shortly after takeoff, causing both engines to fail. It took the combined efforts of Sully’s crew and over 1,000 first responders in New York City and New Jersey to ensure the safety of all 155 passengers. But director Clint Eastwood’s big screen adaptation of the famous incident opens with an alternate version of the crash – one that ends in a fiery (and eerily familiar) explosion into the side of a New York City skyscraper. Why risk the fury of moviegoers with such distressing 9/11 imagery? Because it shows how differently it could have ended without Sully’s heroic act, and in doing so, gets the audience firmly behind its subject from the start. 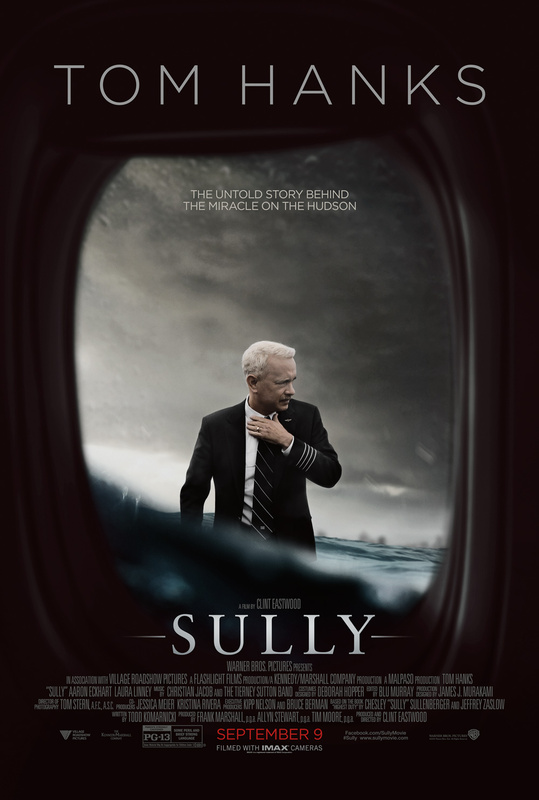 The film begins several weeks after the so-called Miracle on the Hudson, with Sully (Tom Hanks) and his crew, including First Officer Jeffrey Skiles (Aaron Eckhart), making the talk show rounds to discuss their experience. Unbeknownst to the general public, there was an investigation taking place behind closed doors with the National Transportation Safety Board in order to determine whether Sully’s “forced water landing” (he refuses to use the word “crash”) was justified or reckless. So when a computer simulation of the accident reveals new data that suggests the airplane could have made it back to LaGuardia or Teterboro Airport without injury to any of the passengers, it casts a shadow of self-doubt on the experienced pilot, who’s already under an immense amount of pressure between the ongoing investigation, the numerous media commitments and financial problems at home, not to mention the PTSD caused by the incident itself. Trying to distill the cinematic legacy of an actor/director like Clint Eastwood into a mere 20 films is basically a fool’s errand, as there is no algorithm which can successfully produce a set that will please everyone, but Warner Brothers at least gets credit for taking a decent stab at it, even if the end result is still something that you can only imagine being given as a gift. You can’t really blame them for including “Every Which Way But Loose” but leaving out the sub-par sequel “Any Which Way You Can,” but it’s more than a little eyebrow-raising to see that “Letters from Iwo Jima” without its companion piece, “Flags of our Fathers.” It can at least be said that all of Eastwood’s best Warner Brothers westerns are included in the set, with “The Outlaw Josey Wales,” “Pale Rider,” and “Unforgiven” making the cut, but there are still some inclusions and omissions that seems somewhat odd. Sure, you can accept “The Gauntlet” making the cut because it was the first film he directed for Warner Brothers, but the inclusion of the decidedly dated “Firefox” seems likely to have been inspired by someone in the WB accounting department saying, “Y’know, if we put that one in instead of ‘Honkytonk Man,’ then we won’t have to license as much music.” (On that note, “Bird” probably never had a chance in Hell of making it into the set.) Also, I’m not saying they don’t exist, but if you can find me someone who prefers “Hereafter” to “Tightrope,” I’d love to meet them. Okay, enough bitching. It’s not a perfect collection, but “Clint Eastwood: 20-Film Collection” is certainly plenty of hours of good movies that, for the most part, look really damned good. 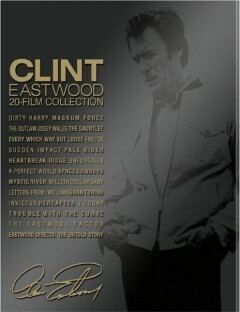 Also, in addition to the bonus materials which carry over from the previous releases of the films, there’s also the highly worthwhile inclusion of two documentaries: 2010’s “The Eastwood Factor,” which is available elsewhere, and the new “Eastwood Directs: The Untold Story.” You might not want to buy it, but you can’t say it isn’t worth owning. It’s Saturday night and you need something to watch. Never fear, Hidden Netflix Gems is a weekly feature designed to help you decide just what it should be, and all without having to scroll through endless pages of crap or even leave the house. Each choice will be available for streaming on Netflix Instant, and the link below will take you to its page on the site. Look for a new suggestion here every Saturday. It’s 2012, so it wouldn’t be all that surprising to discover a majority of young people have not heard of Italian film director, producer, and screenwriter Sergio Leone. After all, the man died 23 years ago in 1989. However, you’d likely be hard pressed to find someone in that demographic who hasn’t seen, or at the very least heard of the man’s work.